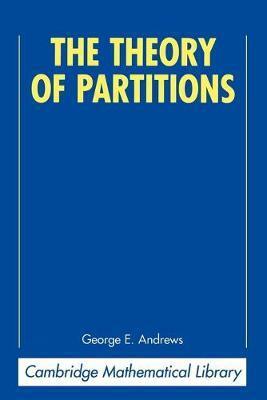 This book develops the theory of partitions. Simply put, the partitions of a number are the ways of writing that number as sums of positive integers. For example, the five partitions of 4 are 4, 3+1, 2+2, 2+1+1, and 1+1+1+1. Surprisingly, such a simple matter requires some deep mathematics for its study. This book considers the many theoretical aspects of this subject, which have in turn recently found applications to statistical mechanics, computer science and other branches of mathematics. With minimal prerequisites, this book is suitable for students as well as researchers in combinatorics, analysis, and number theory. 1. The elementary theory of partitions; 2. Infinite series generating functions; 3. Restricted partitions and permutations; 4. Compositions and Simon Newcomb's problem; 5. The Hardy-Ramanujan-Rademacher expansion of p(n); 6. The asymptotics of infinite product generating functions; 7. Identities of the Rogers-Ramanujan type; 8. A general theory of partition identities; 9. Sieve methods related to partitions; 10. Congruence properties of partition functions; 11. Higher-dimensional partitions; 12. Vector or multipartite partitions; 13. Partitions in combinatorics; 14. Computations for partitions.